Emerging Professionals (EP) are the energetic and dynamic leaders of tomorrow’s green building movement. The USGBC Florida Gulf Coast Chapter's Emerging Professionals group enables like-minded sustainability professionals to be a force for advancement within our community by providing a forum for networking and education. Though there are exceptions, our Chapter's EPs are generally young professionals (under 30 years of age) in early stages of their careers who are interested in or working in the green building industry. Graduate students are encouraged to get involved. Undergraduate students should get involved with existing green building and sustainability networks at their college or university and/or their local USGBC Students Group (see right column on this page). And, generally, team-based activities that will allow you to develop your social, professional and civic capabilities. EPs work closely with Chapter leaders to grow professionally through hands-on experience, GREENworking opportunities and volunteer projects that improve neighborhoods, mobilize green building advocates and raise local awareness about sustainable living. Travis Barnes is the Chapter's EP Chair. Share Your Wisdom and Experience! Calling all Green Mentors! Are you interested in participating in USGBC Florida Gulf Coast Chapter's EP/Students Mentorship Program? The Emerging Professional Committee is seeking experienced professionals to serve as mentors for college students and young professionals interested in pursuing a green-building career. Interested candidates should have dedicated their career to construction, commercial real estate, architecture, engineering, or legal/government with an emphasis in green building, and should have just few hours every month or so to work with our next generation's green leaders. If you are interested, contact info@usgbc-fgc.org. Volunteers -- We Need You! Become a Chapter Emerging Professional and grow your industry connections to propel your career. Click here to join the USGBC Florida Gulf Coast Chapter and choose the Emerging Professional level for $30 ... and add a notable credibility boost to your resume's Extracurricular Activities or Organizations section. EPs acknowledge that positive change for sustainable development cannot occur without the active participation of individuals volunteering and encouraging awareness and diversity in the green building movement. The effectiveness of positive change depends on passionate, informed and capable individuals to implement effective strategies. The Chapter's EP Committee, which is also represented at our Branches on the Gulf Coast, serves as a point of entry for emerging professionals into the USGBC and the green building movement, and to develop resources and networks to support their evolution into dynamic, visionary leaders who are dedicated to the creation of a sustainable future. The USGBC is actively working in partnership with students, faculty and administrators to strengthen campus sustainability efforts across the USA. The USGBC's Center For Green Schools Higher Education is a wonderful resource for greening your campus. Included at that link are Campus Profiles, Schools in Action, Getting Started with a Green Campus, Roadmap to a Green Campus ... and more. To discuss setting up a USGBC Student Group on your campus, contact David Chi Chi Truong. To join the Chapter as a Student (only $30 and all the benefits of Chapter membership), click here. 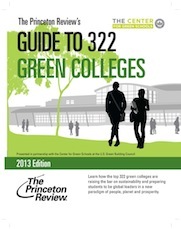 The Princeton Review and the USGBC have teamed up again to release the fifth annual edition of the Princeton Review's Guide to 332 Green Colleges -- a unique, free guidebook saluting the nation's most environmentally responsible green colleges. The 2014 edition profiles 332 institutions of higher education in the USA and Canada that demonstrate notable commitments to sustainability in their academic offerings, campus infrastructure, activities and career preparation. This book is the only free, comprehensive, annually updated guide to green colleges. Click here to review this terrific resource online.